With the 120V 143027FR Ultimate Access/Series V 60 x 96" Motorized Screen from Draper, you can install the case first, and the tab-tensioned screen later. A motor-in-roller system helps ensure this screen provides quiet and smooth operation. Its ceiling-recessed design incorporates an independently motorized ceiling closure for a seamless appearance with the screen retracted. The ReAct surface is designed to control ambient light, while offering unity gain and a 60° viewing angle. 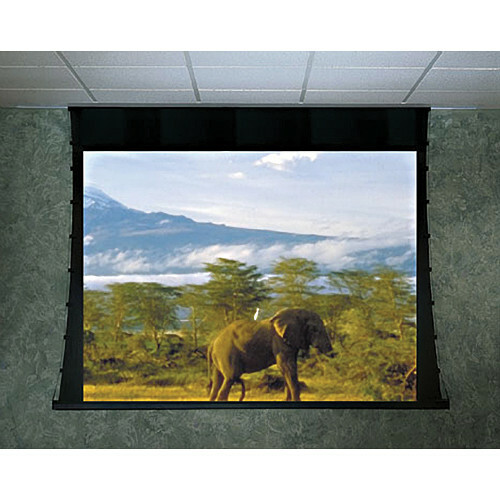 It also boasts high contrast and color rendition, and is suitable for use with HD projectors. Black backing on the other side of the viewing surface helps prevent light penetration from behind the screen.